With a stay at IG-Suites, you'll be centrally located in Rome, steps from Santa Maria della Vittoria and Piazza della Repubblica. 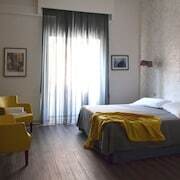 This bed & breakfast is within close proximity of Teatro dell'Opera di Roma and Palazzo Barberini. Make yourself at home in one of the 5 air-conditioned rooms featuring minibars and LCD televisions. Complimentary wireless Internet access keeps you connected, and satellite programming is available for your entertainment. Conveniences include laptop-compatible safes and desks, and housekeeping is provided daily. Featured amenities include express check-in, express check-out, and luggage storage. A roundtrip airport shuttle is available for a surcharge.